Kappa Frater James Williams joins TD Bank as Store Manager in Audubon, Penn. 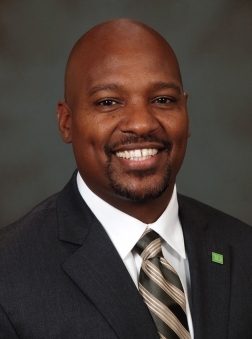 TD Bank, America’s Most Convenient Bank, has named James C. Williams the Store Manager of its store located at 2798 Egypt Rd. in Audubon, Penn. An Assistant Vice President, he is responsible for new business development, consumer and business lending, and managing personnel and day-to-day operations at the store serving customers throughout the area. Williams has five years in banking and 15 years of sales management experience. Prior to joining TD Bank, he served as a Regional Manager at Citizens Bank in Plymouth Meeting, Penn. Williams is a member of the Pennsylvania Association of Notaries (PAN) and the Kappa Alpha Psi Fraternity Inc., and serves on the board of the Willow Grove Football Club. A resident of Abington, Penn., Williams is active in coaching a variety of youth sports in his community, including football, baseball and basketball. He participates in Junior Achievement, teaching children in grades 3-8, as well as the Tax Preparer program and the Adopt-a-School Mentoring program. Williams is a 1992 graduate of East Stroudsburg University and a 1985 graduate of University City High School in Philadelphia. TD Bank focuses on delivering legendary customer service by providing seven-day branch banking with extended hours, free Penny Arcade coin-counting machines, hassle-free products, free online banking and bill pay at www.tdbank.com, and treats for kids and dogs. Customers also have access to a network of 2,600 ATMs from Maine to Florida. TD Bank, America’s Most Convenient Bank, is one of the 15 largest commercial banks in the United States with $160 billion in assets, and provides customers with a full range of financial products and services at more than 1,100 convenient locations from Maine to Florida. Effective April 16, 2010, TD Bank has acquired certain assets of Riverside National Bank of Florida, First Federal Bank of North Florida and AmericanFirst Bank, and currently operates under those trade names. TD Bank, N.A., is headquartered in Cherry Hill, N.J., and Portland, Maine. For more information, visit www.tdbank.com. TD Bank, America’s Most Convenient Bank, is a member of TD Bank Financial Group (TSX, NYSE: TD) of Toronto, Canada, a top 10 financial services company in North America and one of the few banks in the world rated Aaa by Moody’s.